More and more people are realizing the importance of dogs, and are even taking them into consideration when designing vehicles. 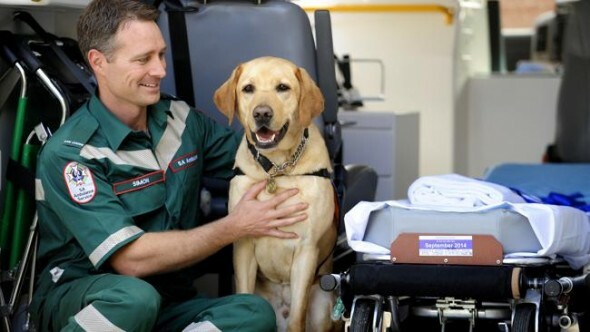 Now South Australia plans to implement a program that will allow guide and service dogs to safely travel with their companions in ambulances. SA Ambulance officials are in talks with Guide Dogs SA and other organizations to work out the best way for the dogs to travel safely while speeding down streets to get their companions some medical attentions. “It’s all about talking with the organizations to work out what will work best, from what length the tethering should be to where it will be in the fleet,” said SA Ambulance acting operations manager Chris Towie. “There’s no doubt we’re getting more patients who have an assistance dog of some type, from people with diabetes to children with autism. To leave them (their dog) behind can be really distressing, but at the same time we’ve got to make sure they’re safe and not in the way of paramedics." Assistance Dogs Australia, who places dogs with adults and children with disabilities, is welcoming the initiative. “Anything that can help make sure they’re with their owners when they need to be is great,” spokeswoman Amanda Hope said.